Taking vitamins is something that we really try to do every day with the boys (I am bad and often forget mine). My five year old son will often get sick of a type and refuse to chew them based on the flavor, color, or any other reason under the sun. Thank goodness NHL is really flexible about vitamins and likes to try different things. He’s also super at reminding us as well. When we were offered the opportunity to try the new alternaVites for kids, NHL said “Yes please!” right away. 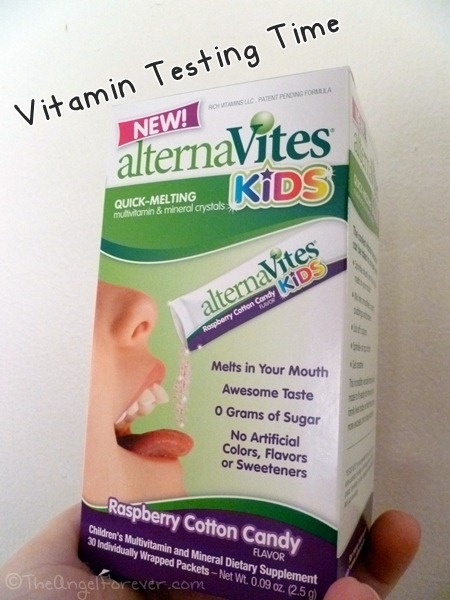 This new product for children is a quick-melting multivitamin and mineral crystals that contains no sugar, artificial colors, flavors, or sweetners. One packet a day contains 17 essential vitamins and minerals that are formulated for children 4 and up. There are two kid friendly flavors available – strawberry bubblegum and raspberry cotton candy. They are certified kosher parve (perk for us) and do not contain egg, milk, peanut, tree nuts, wheat, soy, fish, or shellfish. The packets are versatile and can be taken by kids a variety of ways. The key that NHL learned quickly, you must gently and carefully sprinkle the melts onto the tongue. You can not pour too quickly, or raspberry cotton candy power will fly around the room (we speak from experience here). Of course, you can be creative when taking them. For kids that may not like the texture of a powder, they can be mixed into smoothies, yogurt, pudding, or shakes. They can be sprinkled onto strawberries or other fruits. You can even put them onto a spoon for a child to carefully lick off. I think we will be trying this for JSL since he is not a fan of the melting on your tongue method and I would prefer not to use gummies. NHL likes them so far in our trial and if he did not, well they he would not remind me and ask for them. 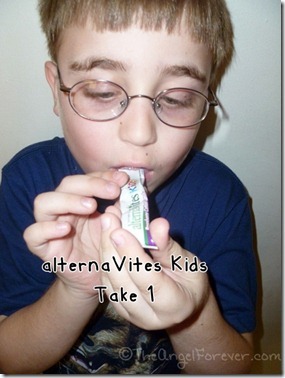 alternaVites would like one lucky reader to try a month of the alternaVites Kids at your home. To enter, please use the Rafflecopter below and be sure to read the rules listed. If you would like to purchase alternaVites, you can use the discount code moms20 for 20% off your order at the alternavites.com website. To enter, please follow the rules above within the comment section and Rafflecopter. Giveaway begins September 17, 2012 and ends September 25, 2012. You do not have to be a blogger to enter, but must leave a valid e-mail address for me to contact you for mailing address once the giveaway is over. You will have 48 hours to claim the prize. If there is no response, another winner will be selected. Open to US residents only. Disclosure: I received a sample of alternaVites Kids to facilitate this review as part of a campaign for Global Influence. No other compensation was received and all opinions are 100% my own. This giveaway is sponsored by alternaVites who will fulfill the prize package to the giveaway winner. I’d like to try them because then my kids might take their vitamins without a fight! Wouldn’t that be nice! Strawberry Bubblegum cause if they see the word “bubblegum” that will seal the deal! LOL.